Sure, you could make this without the bacon, but you’d be missing the beautiful smokiness it imparts. The bits of bacon also add a textural element that take this dish from a soup course to feeling more like a complete meal. Broccoli might work well in place of the cauliflower, though I haven’t tried it myself. If you’re feeling adventurous, give it a try and let me know your results. Place a large pot on medium heat and add the bacon. Cook, stirring occasionally until just browned. Remove the bacon with a slotted spoon and set it aside. Discard all but two teaspoons of the bacon fat and add the onion to the pot, stirring occasionally for three minutes. 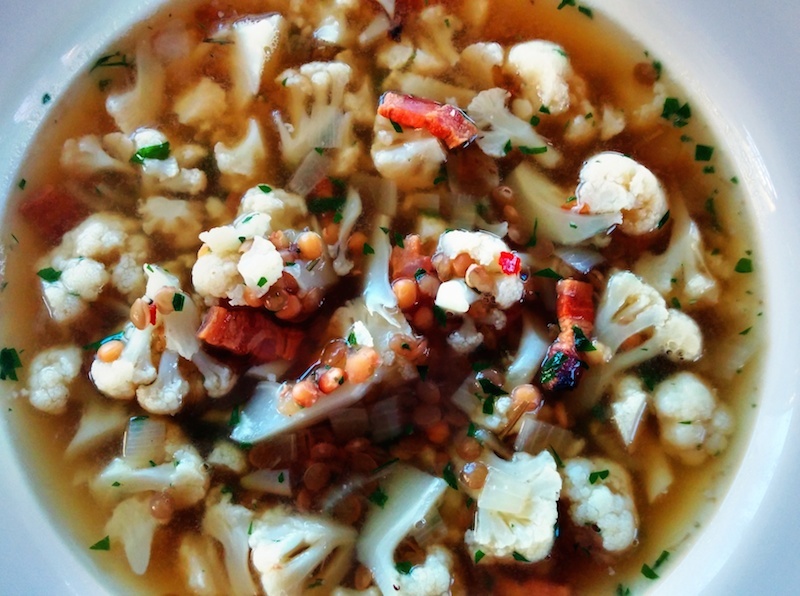 Stir in the lentils, cauliflower, stock, rosemary, chili and pepper. Partially cover the pot and turn the burner to high. Once a boil is reached, reduce heat to simmer and cook for fifteen minutes. Return the bacon to the pot. Stir in the parsley and salt to taste. Looks great Kevin! Just printed it for Linda to make this week. It’s a great soup regardless of who cooks it. I definitely need to cook for you the next time you’re in town.